Homemade ice cream can be a really fun way to bring summer flavors to your bbq or get-together � or your every day meal if you love it like I do! There are a variety of ice cream makers out there on the market from electrical to hand crank, but you can enjoy this wonderful treat even if you don�t want to invest the money in a commercial ice cream maker. If you choose to use an ice cream maker there are plenty of choices, but if you don�t have one and don�t intend to buy one, I have some ideas for you too. There are as many choices as you can imagine when it comes to these little machines. Consider your budget, need for ice cream, and storage space when looking into these. Most of us are familiar with the large, inexpensive ones we see filling store shelves each summer. These are great and tend to work well, but often require a lot of rock salt and ice to get the job done. Space is another potential issue with these as they are often bulky. Smaller, countertop models are also available from a variety of companies, but they generally make smaller portions at one time and for some families that could be an issue. If you plan to make small batches and want to have them often then this type of machine could be a good fit for you. If you don�t want to buy a machine for your ice cream making needs there are a few ways to go make it without one. These ideas require rock salt and ice but can be really fun for the whole family. Still Freeze: Prepare your ice cream recipe mixture and place it in a bowl and freeze. A few times during the freezing process remove it and mix it with a hand mixer. Place it back in the freezer to continue freezing process. 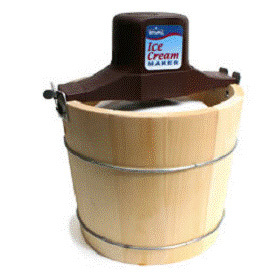 Rolling Can Method: Using clean 1 pound and 3 pound coffee cans you can make ice cream with all your own �elbow grease�. I think this would be fun at a party with kids so they could pitch in on the rolling and preparation. Place your mixture inside the smaller coffee can. Make sure this can is well sealed with tape and plastic wrap to prevent leaking. Then place it inside the larger and fill that one with rock salt and ice. Seal the large can and place it on its side and start rolling it with your feet or hands. After 10 to 15 minutes take the seal off and open the mixture to stir. Reseal and keep right on rolling until you feel like it has reached a good consistency. Plastic Bag Method: This one is really fun for the kids! You can add plenty of flavors and variety to this method, but this is just a basic recipe to get you started with these great little ice cream bags. Mix 1 tablespoon sugar, � cup milk or half and half, and � teaspoon vanilla in a 1 pint Ziploc plastic bag. Then place it inside a gallon size plastic bag and fill that with 6 tablespoons rock salt, and ice cubes. Make sure both bags are well sealed and shake the mixture until it is ice cream, about 5 minutes. This is a really fun activity for the family to do together and can be done camping, picnicking, or at home. Add some toppings and have a real blast. 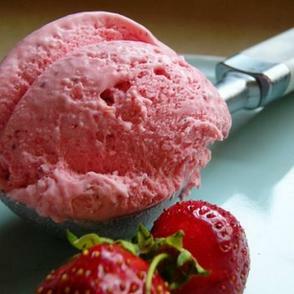 Nothing is nicer on a hot summer day then a bowl of homemade ice cream. With or without the ice cream maker you can have the wonderful flavors on your table all summer long. Enjoy!